The Gestetner Dsc-435 fully-expandable color copy machine is one of the fastest copiers available today, having very few rivals. An extremely powerful selection of hardware and firmware produce a rare combination of speed, volume and quality. An amazing list of standard features and hardware upgrade options makes this machine extremely versatile, as it can be tailored to any of a number of specific office needs. The Gestetner Dsc-435 operates at an amazing top speed of 35 pages per minute for black and white printing, as well as an impressive 28 pages per minute in color, topping most comparable units in its class for both monochrome and color output. Comes standard with duplexing hardware that enables printing on both sides of the page, decreasing overall costs, man hours and booklet sizes. This machine also comes standard with 1 GB of RAM and two 40 GB hard drives, all of which are shared across print, copy, scan and fax functions. Many types of input data, whether it be scanned or transferred from a network PC, can be stored indefinitely for ease of access and convenience in executing repeated and frequent projects. Copy and scanning resolutions top out at 600 x 600 dots per inch and print resolution is as high as 1200 x 1200 dots per inch. When printing jobs are transferred from a networked PC, the high resolution will keep documents looking crisp, clean and clear, whether it be images, catalogs, brochures or plain monochrome text documents. When set to the default scanning resolution of 200 dots per inch, scanning speeds increase to as much as 35 scans per minute in color and 50 scans per minute in black and white. The automatic document feeder, which holds a maximum of 50 sheets, can be processed in approximately 1 minute using optimal settings. The Gestetner Dsc-435 comes standard with two 500 sheet paper trays, as well as a 100 sheet bypass tray that can accommodate a wide range of printable media. Additional tray add-ons can bring this unit's total potential paper handling capacity up to 3,100 sheets. 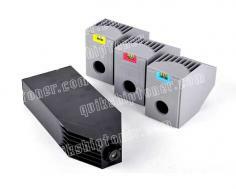 Other upgrades include a selection of finishers, with varying capacities, that are capable of stapling up to 50 sheets at once. Warm up times are advertised at less than 99 seconds. First copy time in black and white is 8 seconds for this model, and 10 seconds for full color. The copier interface allows for three-digit number entry for a maximum of 999 copies. Optional data overwrite security functions are designed to overwrite latent data from print, fax, scan and copy jobs that are not designated for saving on the hard disks, a safeguard that prevents unnecessary drive space usage and unexpected errors and malfunctions. Other user and data security features include password-protected address book and data encryption, PDF direct print password protection, locked print, assignable user codes and user authentication. Paper weight ranges are limited, only allowing for a minimum weight of 16 pounds and a maximum of 34 pounds. 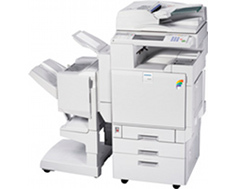 Most standard printers and copiers can support paper weights of up to 48 pounds. Reduction in allowable maximum paper weight is sacrificed in exchange for the high print and scan speeds. Purchasing this machine can be extremely difficult and confusing when doing so from the company's sales material, as there are three levels of options to choose from based on the features that are required. The DSc-435 is the mid-range model with most but not all of the upgrade options available, which makes this the second-fastest producing model of the three. Review it: "Gestetner DSc-435 "
Black toner cartridges can be purchased with a page yield of 24,000 at 5% page coverage. Cyan, magenta and yellow toners for color printing have a maximum yield of 10,000 pages at 5% coverage. 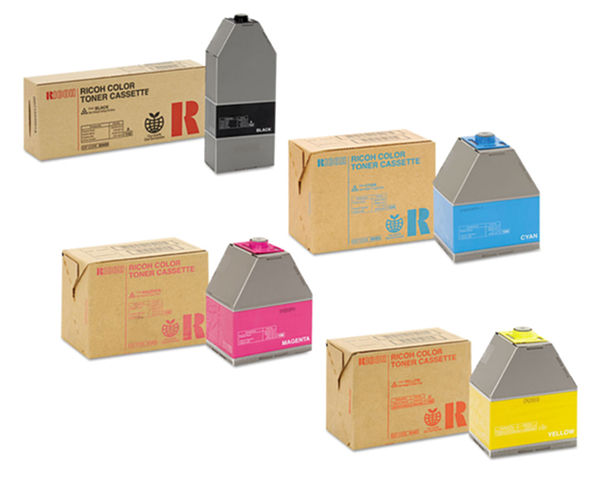 Lower yield black toner cartridges come with a 19,000 page yield at 5% coverage, providing the user a more cost effective toner solution to accommodate decreased demands and volumes. 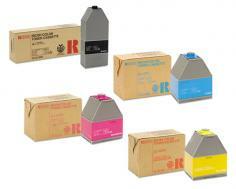 A waste toner bottle is included to help keep the print heads and rollers clean, decreasing maintenance time and costs.